Wide range of Superb snacks & great North Indian Vegetarian dinner in Gurgaon – However miscellaneous eateries in Chandni Chowk ,Old Dilli shops r surely better than OM. Meal for 2 – Rs. 150 onwards depending on what u order. This is one of the best ‘one stop shops in Gurgaon for a really wide range of North Indian Vegetarian snacks , breakfast and major meals. It has a ‘stand & eat’ floor & also a ‘sit & eat restaurant’. Some oof the items of OM which are best in Gurgaon – Chholey (with samosa / bhatura) , Jalebi (sophisticated version), Dhodha (second best), aloo tikki (sophisticated version) & tandoori paneer. They also serve South Indian, Chindian (veg manchurian etc – which no Chinese worth his salt has ever heard of), Bakery (bekaar e), mocktail (do not mock pls) & many such things which they surely r not specialists r these r just fillers for people who like the eatery but want a break from North Indian. OM Sweets with its older shop in old Gurgaon has two new shops in sector 14 market & sector 31 market. Their chholey is the best in Gurgaon – eat it with bhature or kachori or samosa or even in a chat. All these dishes are served with brilliant pickled green chillies. The chholey is dark brown in color, has a strong spicy taste, a grainy texture of the gravy and is not at all tomatoee. 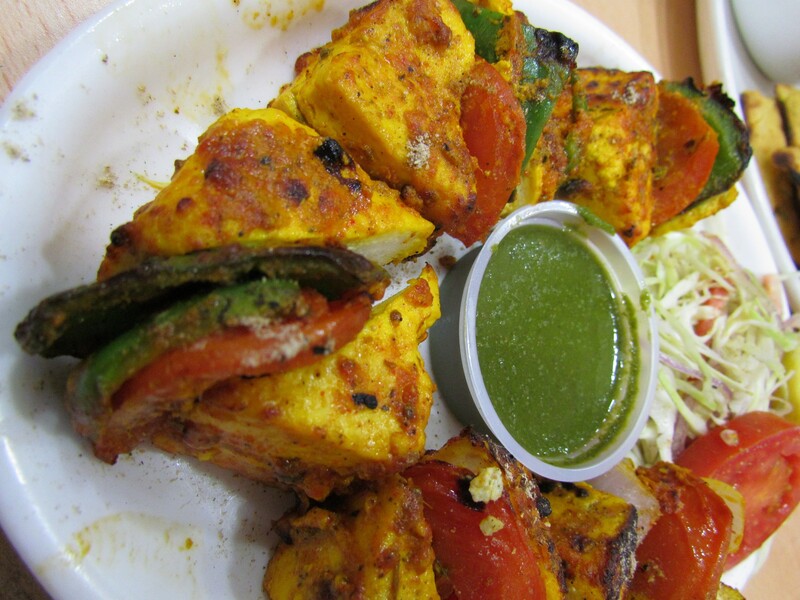 The tandoori paneer is also the best in Gurgaon – excellent quality of super soft & juicy paneer is used & the taste of the masala sprinkled on the top makes the dish too good. On many occassions we have dinner with subzis, daals, & miscellanoeus Indian breads & most of them r good. Garlic naan is one of the best among these breads. Veg Thalis r super cool too. 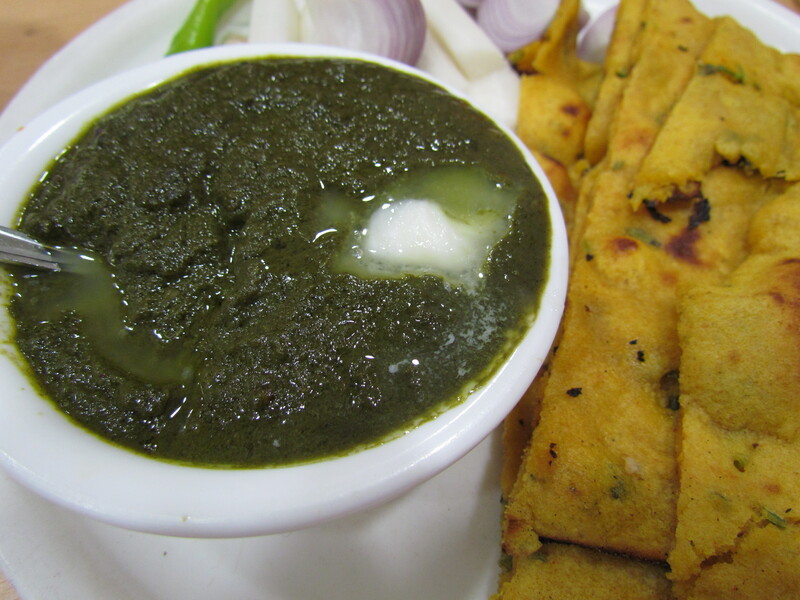 In winters we do not miss the sarson ka saag & Makke di roti. Its as good as it can get in a restaurant. Second best in Gurgaon – after Bikanervala. Love the Golgappas (served like ‘on the street side’ – 6 to 7 people stand with bowls in their hands & the guy serves them one by one according to their preference of ‘sukha’/ ‘meetha’ / ‘chatpata’ / ‘mix’ and also the classification of atta / sooji). The chhats here r also one of the best sophisticated versions in town – aloo tikki, samosa chhat & kachori chhats. What I mean by sophisticated is that they r made in front of u & look to be very hygenic. The Old Dilli versions r surely more tangier & tastier but maybe they wud score less on hygeine. The halwas are good & probably best in Gurgaon – but nothing as compared to the Gianis in Chandni Chowk . For more details on Chandni Chowk food, pls see my blogpost on Chandni Chowk. OM is best known for their tasty sticky, ‘cashew & nut’ infested, mildly chewy dark colored sweet called Dhoda. They have many other varieties of sweets but none as unique as Dhoda. I find Dhodas of Kishu di Hatti in New Colony of Old Gurgaon to be the best. Overall – Great place to eat out.